65 days. Solanum lycopersicum. Open Pollinated. 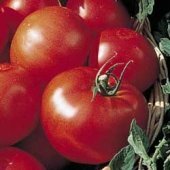 Plant produces good yields of 4" size red tomatoes. They are very flavorful. Perfect for sandwiches, salads, and slicing. You can sow the seeds directly into garden. The seeds will withstand temperatures as low as 18 degrees in Canadian trials. Excellent choice for home gardens. A heirloom variety from Canada. United States Department of Agriculture. PI 339914. Determinate. I live in the mountains of So Cal where we can get snow or cold snaps until the end of May or 70 degree days in February. I've grown Cold Set for the last four years and they have consistently been my best performer despite whatever Mother Nature throws at them. Excellent flavor and consistent production (I usually pick the last of them in November). Highly recommended.